The new Opera Next 15 beta is the re-imagined and slimmed-down version of Opera’s desktop browser. This release comes on the heels of the company’s revamp of Opera 14 for Android. There’s plenty new in Opera Next 15, although some of the changes are in keeping with Opera 14 for Android, which was released last week. 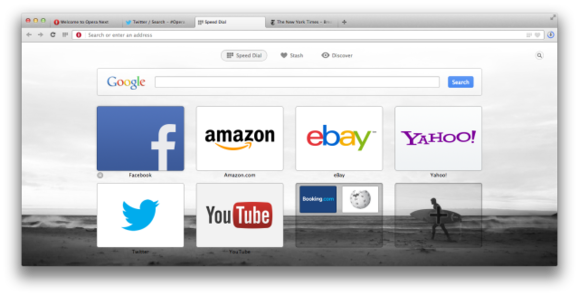 Opera 15’s user interface is simpler, with a single bar for URL and searching, like those found on Chrome and Safari. You can turn on the suggestions from the privacy settings and choose among multiple search providers. 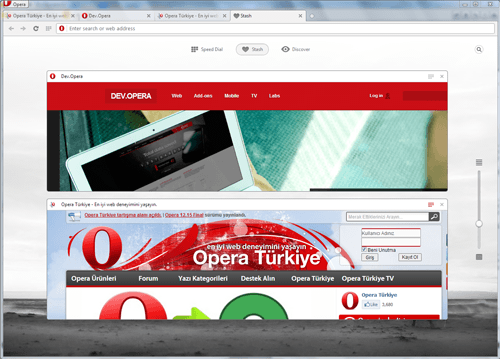 The Speed Dial quick website access feature of Opera 14 has been brought to the desktop and merged with the bookmarks, which now can be found in the top-right corner of the address bar. The mobile version’s Discover feature also made its way onto the new desktop version, with 13 categories in 32 languages of aggregated content for you to browse. Another feature is the Off-road mode (previously called Turbo), which compresses pages through Opera’s server to reduce their size before they reach your computer. This could be particularly useful when using slow connections or when your laptop is tethered from a smartphone or a MiFi device. However, secure (https) pages don’t get sent through Opera’s proxy. One new and interesting feature is called Stash. It aims to help those who keep countless tabs open in their browser for later reference. This lets you mark a page (via a heart icon) that will be added to the Stash available from the start page. You are able to see screenshots of all your stashed pages there, as well as adjust them on a grid, depending on how many you have. If you have a lot of stashed items, you can click the search icon in the top right corner of the page. Besides the exterior changes, a lot has changed under the hood in Opera Next 15. Again, as with the mobile version, Opera dumped its proprietary Presto web page rendering engine and adopted WebKit, the engine used by Apple and Google—but more specifically Blink, Google’s fork of WebKit. The new desktop and mobile browsers will now be named to reflect the version number of the engine powering the browser. Opera for Android has been given the number 14, while the desktop version is named 15, as it is based on a more recent engine version. Opera users will also notice some things missing in Opera Next 15. The M2 email client is not included in the browser anymore. This is to reduce the footprint and memory usage, Opera said, so it has now moved the app in a standalone client called Opera Mail. The new app adds labeling, filtering, threads and multiple tabs. Opera Next 15 leaves behind its extensions architecture, so Opera 11 and 12’s extension format is no longer supported. Instead, the Chromium extension model is used, and there are tools to convert old extensions. Mouse gestures and keyboard shortcuts are still there, but they are off by default and need enabling from the settings panels if you want to use them. Opera Next 15 is still in development. However, the company said it would have a fast release cycle, with feature additions and bug fixes based on user feedback.